Air Conditioning Tune Ups Before You Leave On Vacation? Summertime is just around the corner for many of us in the Pasadena area. This time of year, many homeowners are planning to leave on vacation during summer months. If you’re planning to go away, there’s things you’ll want to do to prep your home so that while you’re gone everything will stay in good order until you return. One of the systems in your home you’ll need to pay attention to is the heating, air conditioning, and ventilation, or better known as HVAC system. Our professional Pasadena air conditioning tune up technicians here at Brumwell’s Instant Heating & Air Conditioning, Inc. want to give you a tip or two about preparing your system to be left alone for a while. Preparing it prior to vacating the home for any length of time ensures that you won’t be faced with problems while you’re away and that the home stays in good condition even though it is going to be without anyone there to supervise the systems. 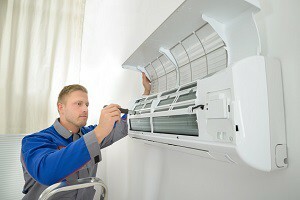 Before you go away for a while, you’ll want to ensure the air conditioner runs at peak performance. You know when you return you’ll want to be sure the system works well and don’t have to mess around with suffering in the heat. An HVAC system that sits idle for a time isn’t a good thing because the machine parts are stressed when it first turns on again. Think of it similar to an old car that’s been used for years and then suddenly sits for a while. It just has difficulty getting turned on again and will likely have a problem the first time you do. Your HVAC system is the same. The moving parts are built to move, not sit. So there are two things you need to do before you leave. One, schedule a tune up to get the system cleaned and lubricated, and thoroughly checked for weakened or damaged parts so we can get them fixed up and the unit works at peak performance. Second, ensure you keep the air conditioner on while you’re away. We understand how you’ll want to turn it off completely, but this is the worst thing you can do. You don’t want it to sit idle, even if you just tuned it up. Your home needs the air flow and ventilation process that the air conditioning system handles. Moisture in the air in an empty house that sits creates problems for the building materials. Your ceiling drywall will bulb out, creating a ripple look on your ceiling. Moisture can absorb into texture or behind paint or wallpaper causing it to begin peeling. Carpeting can become damp with dew and get moldy. In a short amount of time your beautiful home can turn into a nightmare when you leave the air off while you’re away, so be sure to set the temperature where it will turn on at least a couple of times a day while you’re away. Give our Pasadena heating and air conditioning company a call today and schedule your air conditioning tune up right away before it gets hot and you find yourself already calling for repairs! If you are looking for an air conditioning tune up in Pasadena then please call 410-360-0002 or complete our online request form.